This is a guest post by Sophia Lian, intern for Energy and Climate Policy at the Council on Foreign Relations. Since the collapse of the Soviet Union, Beijing and Moscow’s shared goal of reorienting the Western-dominated global order has led them to cooperate on many fronts, including energy infrastructure and institutional development. Despite lingering mistrust, the two countries recognize their complementary strengths and have pushed forward in their opportunistic partnership. Much needed Chinese investment in Central Asia, the Russian Far East, and the Arctic will tap vast energy stores and provide institutional support in remote locales. As Moscow keeps wary watch over increasing numbers of Chinese migrants in its backyard, Beijing is careful to alleviate concerns of encroachment by publicly deferring to Moscow’s leaders while highlighting regional benefits of Chinese investment. In securing a foothold in Russian territory through the eastern stretch of the Belt and Road Initiative (BRI), China is laying the groundwork for future geopolitical plays. Strategically consolidating Chinese influence through economic development in the Russian Far East, Central Asia, and the Arctic aligns with President Xi Jinping’s more activist brand of foreign policy. Based on one’s perspective, Beijing has already been treading a fine line between Russian collaborator and competitor. The Russian Far East is a region of strategic importance and historical sensitivities. This icy region abounds with natural resources and is the site of Russia’s only warm water Pacific port (Vladivostok). Russia’s coveted possession of a Pacific outpost was realized in the late 19th century when it successfully compelled a weak China to sign over control of the region whose loss China has not gotten over. Against this historical backdrop, Russia has closely guarded its sparsely-populated eastern hinterland, and has until recently rebuffed Chinese business forays into the region. However, the collapse of its relationship with the West over Ukraine has left Russia little choice but to turn to Beijing for finance and economic development assistance, and Russia’s moment of weakness is opportune for an energy-hungry China eager to diversify its energy sources and enhance its strategic positioning. Economic development has been quick to come to the Russian Far East. Chinese capital now accounts for 45 percent of the total foreign investment in the regional capital, Khabarovsk. A little ways south in the port city of Vladivostok, Chinese money has transformed the area into a tourist center, when only a few years earlier both far eastern cities lagged far behind their European Russian brethren. Similarly, China has taken an interest in Central Asia as a potential hub for expanding Eurasian trade flows and has secured energy development, transport, and infrastructure projects as part of its BRI. China claims its collaboration in the Arctic will help develop the region’s untouched bounty of natural resources. In undertaking these projects, however, Beijing contends with Russian territoriality as the Kremlin is weary of privileged Chinese access to areas that could ultimately jeopardize Russian sovereignty. China’s consolidation of geopolitical assets through infrastructure investment extends to the Middle East, Africa, and Europe, which could challenge Russia’s traditional role as a major energy and arms supplier. Russia’s economy and influence is highly dependent on its energy and arms exports, whose domain its southern “frenemy” has increasingly encroached upon. While Russia has been developing new weapons systems, China is now poised to become a dominant arms exporter after decades of copying and appropriating Russian technology, and integrating such technology into both its defense and private tech industries. Moscow’s economy is not as resilient in that its defense-driven economy cannot fall back on civilian demand like China’s economy can (through dual-use technologies). China is gaining ground in countries with troubled human rights records and has recently been successful in arms sales to several African countries (e.g., Algeria, South Africa, Kenya, Cote d’Ivoire) in addition to continued large sales to regional buyers Pakistan and Afghanistan. The Kremlin has made clear its aims to become a dominant energy power in the Middle East and has recently inked several business deals in the region. But China is close behind, staking out Mideast energy deals, especially in Iran and Iraq. The recently acquired 80.1% stake of the South Pars gas field (taking up a 50.1% stake from French energy giant Total, which is withdrawing because of U.S. sanctions) will mean China could become a natural gas exporter in competition with Russian firms Gazprom and Novatek. The competition is direct since Russia views its energy exports as not only a means to needed petrodollars but also as a geopolitical tool to build spheres of energy dependence. China emulates the same ends via its BRI, and more recently through its planned expansion into the nuclear energy export market. China is playing the long game in this regard, and its patience has paid off as the UK has recently given the green light for the Hinkley Point C power station of which an important piece of infrastructure is Chinese. This is hugely significant as no western country has opened up their strategic infrastructure to a non-ally in this way. Britain’s approval, which brought consternation from the U.S., could jumpstart China’s reach to the rest of the world. Beijing envisions building 30 nuclear plants along its BRI path by 2030, and though Beijing and Moscow collaborate in developing nuclear technology, Russia is sure to chafe at China’s ambitions. Chinese activity in nuclear power directly competes with Russian natural gas sales to Europe, as do energy associated with other Chinese sources, including wind farms, exports of solar panels, and eventually battery storage. China is also buying other critical infrastructure in eastern and southern Europe and Greenland, further extending its reach to the west. Deals worth at least $255 billion across the European continent have resulted in almost 360 companies having been taken over and China also is now partially or wholly owning at least four airports, six seaports, wind farms in at least nine countries, and thirteen professional soccer teams. Last but not least, long considered the world’s largest rare earth producer, China has a chokehold on cheap access to these essential elements, and recently concluded an agreement aligning uranium and rare earth mining activities between the Greenlandic and Chinese governments, giving China almost exclusive control of this domain. Over the previous decades, China’s influence has strengthened to the point where it can now challenge traditional hegemons like Russia -- but for now, a partnership is still preferred. Though Moscow is wary of the myriad Chinese projects being undertaken and of the increasing numbers of Chinese migrants in its backyard, it is currently managing its insecurities quietly since it recognizes the need for Chinese capital and manufacturing expertise to tap undeveloped resources and to build needed infrastructure, partly to counter its souring relations with the West. The two countries have thus found common cause on a number of issues, from mutual diplomatic support on the UN Security Council, to military reinforcements and economic collaboration. Naval exercises in the Sea of Japan, South China and Baltic Seas showcase solidarity in areas of tension with Washington. Of course, these displays are meant to project a united image that is not so sanguine under the surface. China has, over the years, avoided inconvenient entanglements and has demonstrated its utility as a source of capital, infrastructure, and arms. Now, stronger and under more expansionist leadership, China’s reach is set to expand much farther afield under its ambitious BRI. 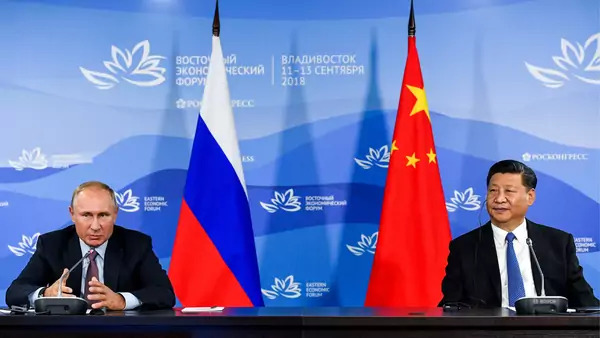 For now, China appears willing to refrain from overt challenges to Russia, as Beijing’s immediate need for imported raw materials and desire to focus on its BRI ambitions requires a cooperative Russia. Beijing has tried to ease Moscow’s insecurities about perceived Chinese encroachment by promising economic benefits, and staying relatively respectful of Moscow’s Eurasian security interests while it focuses on economic and industrial development. So far, the arrangement has worked for both parties and has even led to an interesting turn of events, where Chinese troops were invited to participate in the massive 2018 Vostok war games -- Russian military exercises historically meant to prepare for border confrontations with China. It is unlikely that Russia suddenly considers its long-time adversary an ally, but the two will continue to outwardly collaborate until it is no longer in either’s interest to do so. Future increases in energy export and investment competition in Europe and beyond could be the first signs of strain in the uneasy relationship.